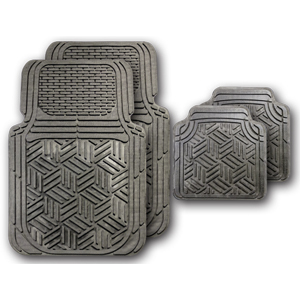 Waterhog Car Mats in the Defender Pattern offer the same rugged durability of the traditional waterhog entrance mat but designed with a universal fit to hug the floor of your car, truck, van or SUV. • The all-rubber construction of these waterhog defender car mats is stain-, fade- and mildew-resistant and will not fade or rot. • A water dam border helps these defender waterhog car floor mats keep the water and moisture on the mat and off the floor.